Abstract: Traffic congestion occurs when a volume of traffic or modal split generates demand for space greater than the available street capacity. In the rush hour, the traffic congestion is rather common, which usually held those up. To our relief, Airwheel R8 triangle electric bike came out to relieve such concern. Nowadays, the traffic congestion has become commonplace and it can lead to drivers becoming frustrated and engaging in road rage and road rage can lead to altercations, assaults, and collisions which result in injuries and even deaths. If they do not drive cars, they may choose the bus or metro. However, commuters spend a lot of time on waiting for the bus or metro. But when the bus or metro arrives, the bus or metro is so formidably crowded. Hence, Airwheel R8 electric cross bike was born in time to shoot the troubles. As soon as Airwheel R8 mountain electric bike came out, they were welcomed by thousands of customers. It sells like hot cakes. For one thing, it has upgraded many details to improve riding comfort. It chooses the triangular structure formed by a bending long pipe, with an aluminum alloy casting to lock the joint, leading to high performance of crush resistance. R8 is also designed with the adjustable operating rod. Riders can shorten or lengthen the operating arm to get the most comfortable riding posture. For another point of view, it seems the design of R-series is attractive and R8 is a sports utility vehicle with excellent traffic ability. Airwheel R8 adopts 26-inch jumbo tires. This kind of jumbo tires enable R8 to conquer any terrain. 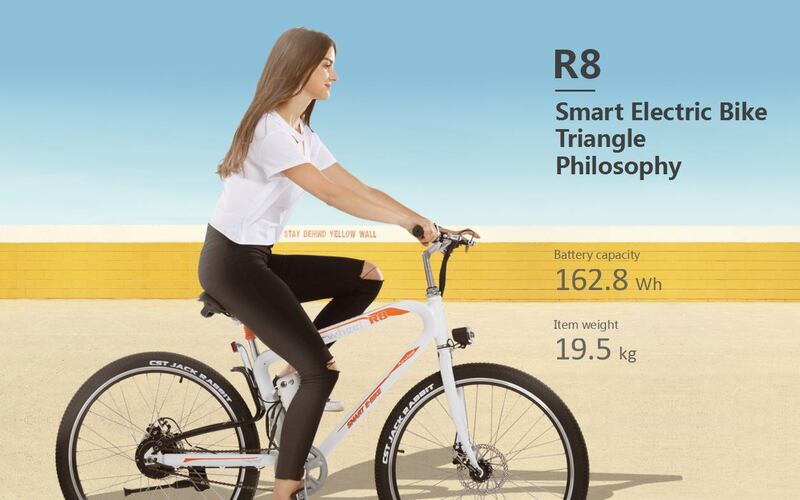 For R8 electric mountain bike, negotiating the rugged terrain or go downing the steps is just a piece of cake. Moreover, its brushless motor provides strong power with steady and continuous power output to ensure the vehicle negotiate on slopes, sand and other road conditions as easily as riding on plain roads. The shock mitigation systems under the saddle enable riders to conquer various road conditions smoothly and gracefully. In a word, R8 brings great convenience for users. It is more than a commuting vehicle, but also a piece of art that is carefully designed by Airwheel. That's the secret why it sells like hot cakes.